I have not posted in a while, though there is much to post about... but as of late many unrelated matters have been keeping my hands full.. So I'll catch up on the blog later. But as for now, only a few minutes ago, I paid $6.00 and $2.50 shipping for this magazine page; Description:"This is an original 1 page magazine review. It measures 8 1/4 x 11. Has a small tear bottom edge. The review is in good condition." That's all it said along with a picture of the page (shown below). 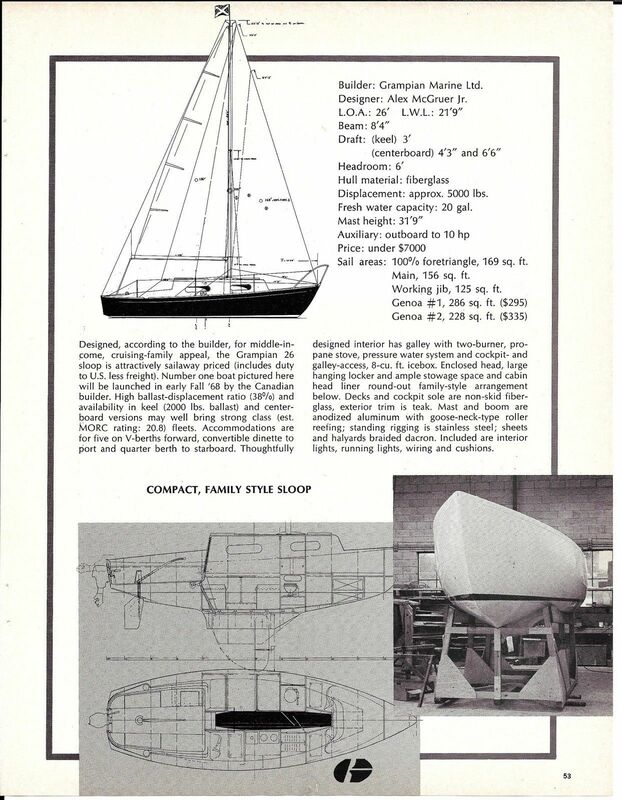 I added it on the Grampian 26 Original Advertisements page - although it's not an ad.. Curiously it states "..cockpit-and galley-access 8-cu. ft. icebox...", I've not come across any other mentions of icebox access from the galley before.. but quite the contrary have heard complaints of the icebox not being accessible from the cabin in the G26.. I am assuming perhaps some early models may have featured access from behind the dinette aft seat cushion, which by the way is a modification I have considered on my own. Also of note is the Morc rating of 20.8 - a term which I have no familiarity with, but a quick search tells me it stands for Midget Offshore Racing Club Rule which is a measurement rule for racing boats under 30 feet. Anyway, here is a scan of the review..